Dr. Haresh Mehta is one the best Cardiologist in Mumbai has an experience of close to 20 years in his field. 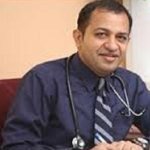 He is an Interventional Cardiologist with well-rounded clinical, scientific research and academic experience and has had international exposure in the practice and techniques of Interventional Cardiology. Dr Haresh Mehta has worked closely with the world's best Interventional Cardiologists known for their pioneering scientific & research contribution which has further developed his skills and expertise. Being a part of many ground-breaking research projects and establishing new frontiers in Interventional Cardiology has always kept Dr Haresh Mehta motivated. He would like to continue contributing extensively to the growth, development and scientific progress of Interventional Cardiology in India and across the world. Dr Haresh Mehta already has over 10000 independent interventional cases to his credit performing majority of his interventional cases from the transradial route. Dr. Haresh Mehta has trained in coronary and pediatric interventions at University Hospital Bern Switzerland. He has been Clinical Observer in the Department of Thoracic Medicine at Central Middlesex Hospital, London with Dr. Derek Bell, M.D. for a period of nine weeks commencing 1st September 1994. He has handled a wide range of patient cases addressing valvular heart disease catheterization, congenital heart disease catheterization, balloon mitral valvuloplasty, balloon aortic valvuloplasty, balloon pulmonary valvuloplasty, co-oarctation dilatation, sub aortic membrane dilatation etc. Award of Second Best Dissertation Presentation in M.D. (Internal Medicine) in July 1993. Dr. P. T. Patel award for getting highest number of marks in the subject of “Fevers including Tuberculosis” in the competitive examination held in 1989 at K.E.M. Hospital, Mumbai. Women and heart disease. Are we risk free?